UGC NET Application Form 2019 – National Testing Agency (NTA) releases application form of National Eligibility Test for Assistant Professor and/or Junior Research Fellowship. 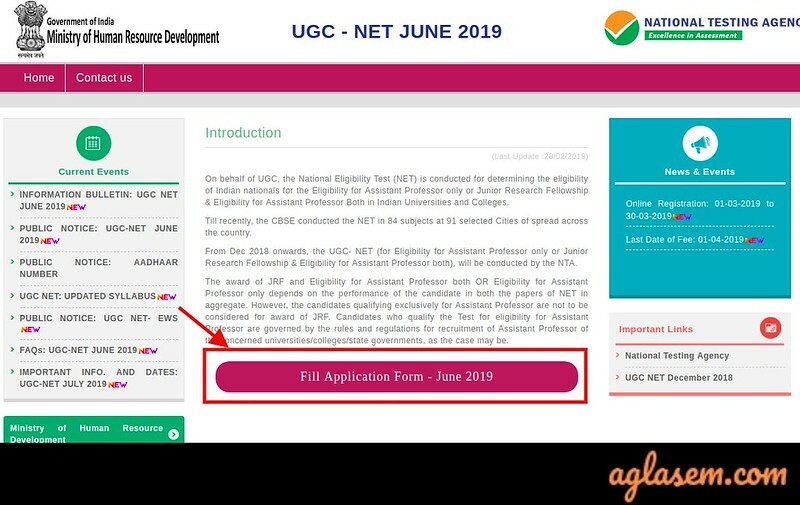 Last date to apply online for UGC NET June 2019 is over. If NTA conducts NET again in 2019, then its details will be updated here. NET aspirants can register online at ntanet.nic.in and pay fee as per category. Application fee is Rs 800 for general, Rs 400 for OBC, and Rs 200 for SC, ST, PWD. 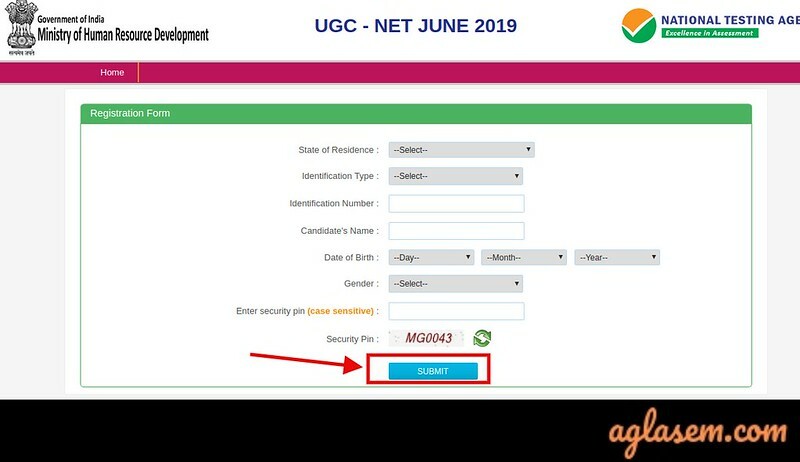 Those who apply online can download admit card of UGC NET 2019 from ntanet.nic.in. 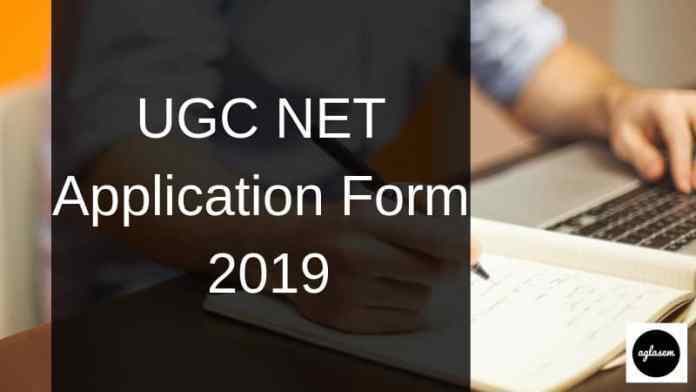 Get here all details of UGC NET Application Form 2019 including date, fee, apply online and other information. Complete schedule of UGC NET June 2019 Application Form is as follows. The candidates can check the eligibility criteria before filling the application form. Age limit: Although the NTA did not restrict the upper age limit for the Assistant Professor, the candidates who are applying for the JRF have to be careful about the upper age limit. The upper age limit must not be more than 30 years. Educational qualification: The candidates should have a postgraduate degree with 55% marks. The candidates of SC/ST/OBC (NCL)/PWd category who have secured 50% marks were eligible to apply. The candidates have to pay the amount as per there category. The candidates can use the online/offline mode to pay their application fee. The candidates are free to use any mode whichever suits them. Through E-challan of SBI / HDFC / Syndicate / ICICI Payment Gateway. While filling the application for the candidates are needed to provide some essential document which certifies their eligibility for the examination. For this, the candidates take a reference from here and can chcek the list of the document and details. As per the previous examination the candidates had to upload the photograph and signature as per the specification provided below. At first, the candidates are instructed to take their pictures with a white background. While taking photographs wearing cap and goggles are not allowed. The candidates have to take their photograph indicating their name and date of taking a photo. Poloriad and computer-generated photographs are rejected. For uploading the signature the candidates has to take the full signature. The candidates has to upload the documents as per the given specification. 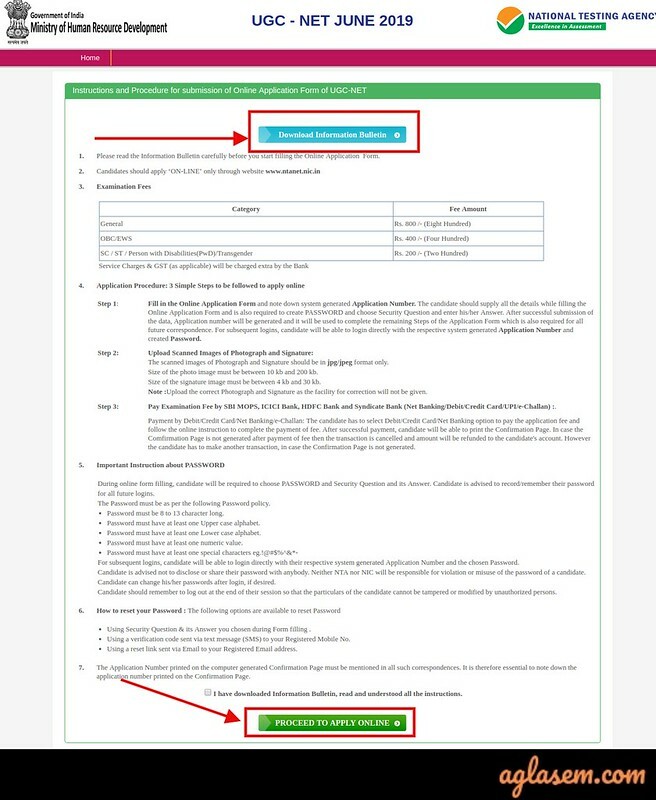 How to Fill UGC NET Application Form 2019? 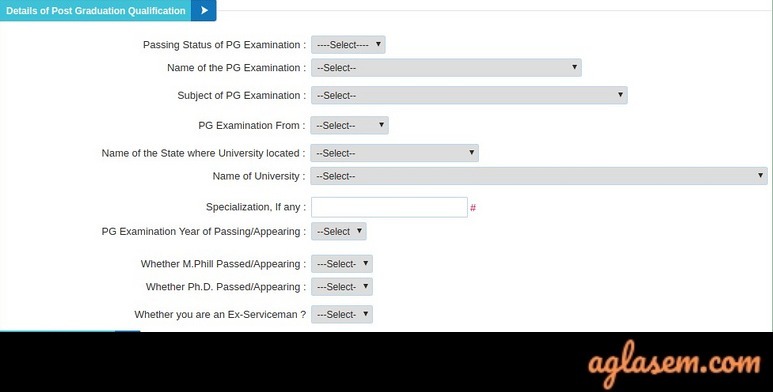 Now the candidates can check the steps to fill in the UGC NET Application Form. The application form of UGC NET 2019 has been provided on the NTA’s website as per the schedule. The first step was registering yourself on ntanet.nic.in. For this, the candidates have to click on the above link which is activated and provided above. 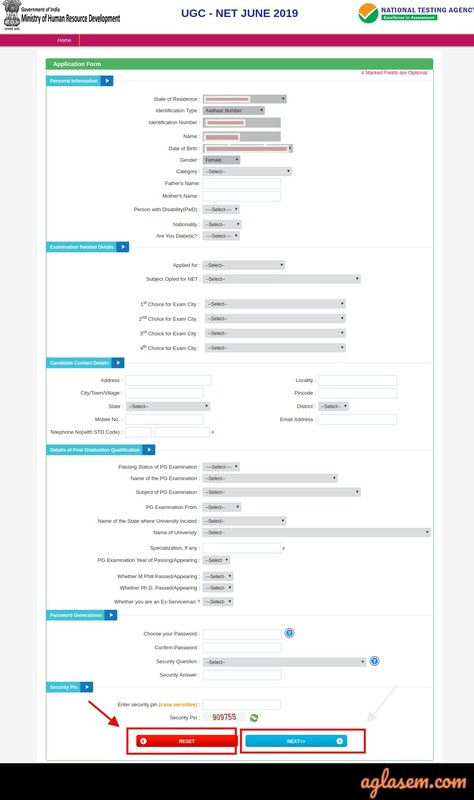 Thereafter the candidates have to click on “Fill Application Form – June 2019”. Now login page opens. Thereafter the instruction page opens here the candidates have to download the Information bulletin first. Later he/she will be allowed to proceed. Aadhaar Card, and other candidate’s general information. In this section, the candidates have to mention the EWS category if they belong to get the reservation in higher studies. This scheme is introduced first time in UGC NET by MHRD. Name of examination e.g. Assitant Professor or JRF and Assitant Professor. Examination city and preference of them. Later candidates have to fill out the “Post Graduation Details” in the form. At last, when the candidates will fill all the details that they have to secure their for by selecting the secret question and generate the appropriate password, which is difficult to guess. At last, on successful submission of the form, the candidates will receive their self-generated password and user id. Once the above process completes, the next thing a candidate has to do is to upload the photograph and signature. After registration, the candidates are redirected to the login page. Their candidates have to do a fresh login and upload the documents. The last and final step of application form is fee payment. As per NTA candidates can use the SBI_MOPS (Debit/Credit Card or Net Banking e-challan) and have to keep proof of fee paid. This is the confirmation page of the last time application process. It is mandatory to take the copy of the Confirmation page for future reference. Please take at least 04 copy of confirmation page. NTA provides a chance to correct the mistakes in the application form. The application correction window is active during the stipulated time. All field are editable. Even candidates can change their photograph and signature. But all these changes have to be completed in one go. Once the process of application will be done successfully the candidates who will have submitted their application in time will be provided the admit card for the examination. The candidates will be able to download the admit card from ntanet.nic.in. The candidates will have to provide the login credentials to download the admit card. The only mode of getting the admit card is online apart from that no other mode will be provided. Roll number provided in admit card is also used to check answer key of UGC NET 2019. Moreover it is used to check result. The UGC NET 2019 examination is being conducted by the National Testing Agency (NTA) formed to conduct such national level examination. On the basis of result of UGC NET – University Grant Commission National Eligibility Test – candidates are determined for eligibility as Assistant Professor or Junior Research Fellowship & Lectureship both. This year the examination will be conducted in online mode, as per the new syllabus provided by the UGC.